Klip Gallery: Quintly – How can we help you today? 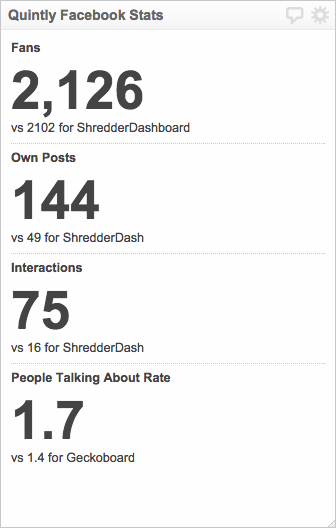 Track, benchmark and optimize your social media performance with Quintly. Find out how to connect your Quintly data when adding a Klip from the Gallery. Compare total followers between two public Facebook profiles over the past 30 days. For your Quintly Client ID and API Secret, email support@quintly.com. 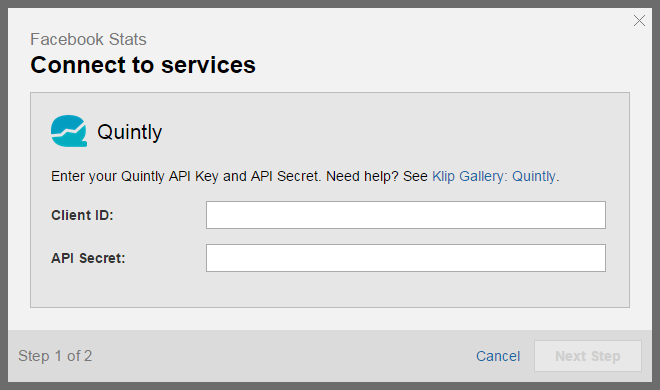 Once you have your Client ID and API Secret, paste them into the Connect to Services dialog box for Quintly. In the Data Source Settings dialog box, select Your Profile and your Competitor Profile from the drop-down lists.